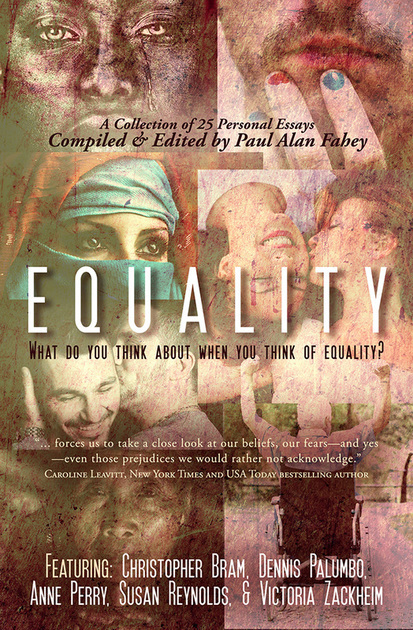 Paul Alan Fahey’s collection of essays about equality tasks twenty-four other writers with this question. Given the topic of this collection, I wondered how the contributors reflected this concept. The anthology has roughly an equal number of female and male writers (twelve and thirteen, respectively, since Fahey includes an essay of his own), and a majority of the contributors fall on the LGBT spectrum, but not all aspects of the LGBT rainbow are equally represented. Most of the authors appear to be American, with one Canadian and two British; and with a couple of exceptions, they also appear to be overwhelmingly of European descent. All this is to say that equality is an ideal, and thus elusive and rarely encountered (it also is not the same thing as diversity). It is therefore not at all surprising that most of the contributors do not dwell on what equality is, so much as what it is not. Few people have experienced equality, but everyone has certainly experienced inequality, whether it is a result of one’s actual (or perceived) race, gender, age, and/or sexual orientation. Most of the contributors reflect on when they first encountered inequality (usually when directed at themselves, but also when they first noticed it directed at others; and some, even from the height of privilege, realized that there were not as “equal” as they thought, since others were higher than they). As a result, most of the essays in this volume are deeply personal in nature, and focus on inequality as a result of race (“Lani Silver: A Voice for Equality” by David Congalton), gender (“Give Us Our Birthright: Why the Equal Rights Amendment Needs to Be Revived—and Ratified” by Susan Reynolds), or age (“The Last Acceptable Prejudice” by Barbara Abercrombie; “Inequality” by Felice Picano). And several essays examine inequality as a result of sexual orientation, especially as it relates to marriage equality (“Limit” by `Nathan Burgoine; “Have You Met My Husband?” by Larry Duplechan; “Ambiguously Ever After” by Jeffrey Ricker; “Two Mountain Weddings” by Jeff Mann), or how it intersects with other inequalities (e.g., “Equality in High Def” by Jewelle Gomez, which examines inequality both via race and sexual orientation). Although the contributors are all equally adept writers, several essays stand out in this collection. Christopher Bram’s contribution, “The Magic Words,” a meditation on the beginning of the preamble of the Declaration of Independence (“We hold these truths to be self-evident, that all men are created equal…”), examines the paradoxes inherent in these words (i.e., that the “men” named in this famous quote were strictly defined as only literal men, and moreover white, land-owning men) and how this narrow notion of “equality” gradually grew more encompassing, a point expounded upon by other essays in this collection. Two thought-provoking essays examine equality through the prism of the Golden Rule. Barbara Jacksha’s contribution,”Everyday Equality,” examines her own thoughts and attitudes to determine whether she treats people equally; no surprise, she doesn’t. But then she turns her experiment on herself and then learns that she doesn’t treat herself as equal to others, either. Similarly, Catherine Ryan Hyde tries to “Imagine a world in which we all applied our beliefs to our own lives and left everybody else the hell alone” in “When I Think of Equality.” Doing so is especially difficult when it means letting another person make a choice that appears entirely and egregiously wrong. Despite the fact that equality remains elusive, and the long road to achieving it has no obvious end, this collection chooses to be hopeful, stressing the strides already made along that road. Released on Martin Luther King, Jr. Day 2017, before the inauguration of the 45th American president, this collection is especially timely.